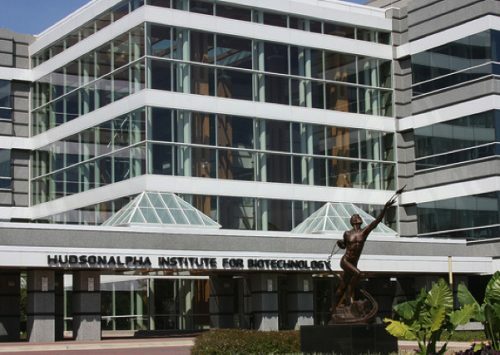 Jeremy Schmutz joined the HudsonAlpha Institute for Biotechnology in 2008 as a faculty investigator. He leads the Informatics and Production Sequencing Groups at the Genome Sequencing Center, which he co-directs with Jane Grimwood. Schmutz graduated from North Central College in Naperville, IL, in three years with a BS in Computer Science and a BA in Biology. While in college, he worked on DNA sequencing technology at Argonne National Laboratory. That experience led to his first research position developing parallel sequencing systems at a small Silicon Valley startup company. In 1996, Schmutz joined the newly formed Sequencing Group at the Stanford Human Genome Center to develop the computational infrastructure necessary for large scale DNA sequencing. Schmutz and his group finished and assembled the human sequence of chromosomes 5, 16 and 19 for the public Human Genome Project. He also led the quality assessment of the human genome sequence that evaluated the accuracy and completeness of the final human genome sequence. 2011-present Plant Program Leader, Department of Energy, Joint Genome Institute, Walnut Creek, Calif.
2008-present Faculty Investigator, HudsonAlpha Institute for Biotechnology, Huntsville, Ala.
1994-1996 Senior Software Engineer, Hyseq Inc, Sunnyvale, Calif. The Genomic Sequencing Center is supported in part by the Department of Energy (DE-AC02-05CH11231, DE-AR0000594, DE-SC0014156), the National Institutes of Health (R01HD080708), the National Science Foundation (1444533, 1444552, 1546867), the US Department of Agriculture (2016-51181-25408), the Peanut Foundation (04-852-16), The American Chestnut Foundation, Cotton, Inc., and the Bill & Melinda Gates Foundation (OPP1129063). The content of this website is solely the responsibility of the authors and does not necessarily represent the official views of the sponsors.